Each year a group of carefully curated artists from all over the world descend on Jukkasjärvi in Sweden to create the snow and ice wonderland that is ICEHOTEL. Part art exhibition part hotel, this year’s incarnation has come together with the help of 34 artists from 13 countries. Made entirely of ice and snow from Torne, the largest arctic river in Sweden, the hotel has just opened its frozen doors for guests to come and marvel at the 15 carefully carved suites. 2500 tonnes of ice (or 10 seconds of water flow from the river) was harvested from the Torne back in March, with everything stored in a giant freezer until October when the ice sculptors started work on the project. The hotel came together in 12 mind-blowingly short weeks and includes a wedding ceremony hall complete with columns and chandeliers that feature over 1000 ice crystals. Many of the artists took inspiration from nature when carving out their suites, there’s a forest camp site room with a fire made of ice that you can pretend to toast marshmallows on and an underwater world with icy corals, shells and fish. 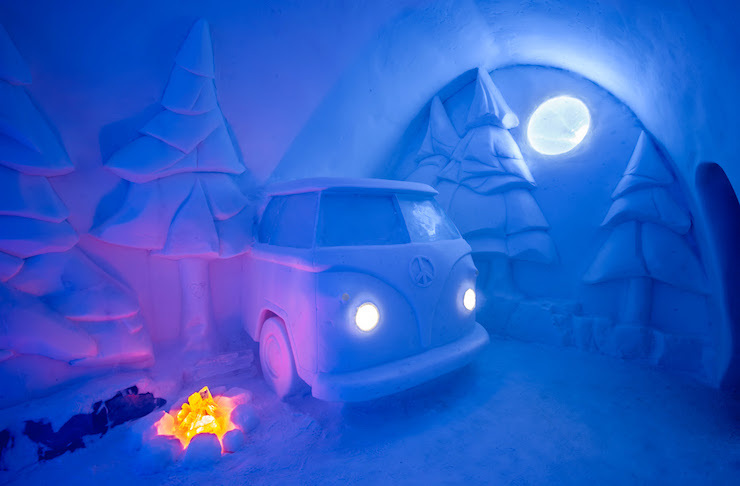 Guests can book into ICEHOTEL’s warm and cold rooms, with most opting for at least one night in an igloo, but it will set you back a chilly 7400 Krona (roughly $1200). Worth it to tick sleeping in an ice cave off your bucket list, though. You can even take part in a festive five course feast served on frozen plates at ICEHOTEL Restaurant or grab a drink in the rocks at ICEBAR. While you’re in Sweden checking out winter utopia you might want to consider adding some northern lights sky gazing, snowmobiling, dog sledding and ice sculpting to your itinerary. All of the ice and snow will melt back into the river by April, so if you’re keen to check it out you’re going to want to make a booking, stat. Considering a hobby in ice sculpting? ICEHOTEL will open applications for the 2019/20 season in late January, you just have to submit a design and you could be headed to Sweden in the new year. Desperate for more winter weather? You can now sleep in igloos under the Northern Lights in Finnish Lapland.